Yesterday some of the Essendon football club players including Michael Hartley and Marty Gleeson, who have been travelling in the US, brought their skills to the NBA's Washington Wizards in an indoor cross training session. Video of the session can be seen below. 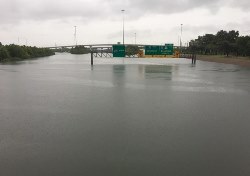 Hurricane Harvey dropped historic rainfall on the Texas coast in late August in the United States. Many locations reported at least 30 inches (76 cm) of rain. Nederland, east of Houston, recorded 64.58” of rainfall. Pearland, in Houston’s southern suburbs, a reported 9.92” fell in 90 minutes. The rain definitely affected the Houston Lonestars footy club. No players were directly affected by the effects of Hurricane Harvey, but their families definitely were. Club members worked to help many others in the aftermath. The Lonestars also pitched in financially, raising $10,000 US between several members. Their August 26th Texas Cup triangular with the Austin Crows and Dallas Magpies was canceled. They did get back into action on September 9 with a sweep of Baton Rouge (seven points) and Nashville (a 26-point win). The Lonestars also fell to Dallas and to the Los Angeles Dragons on September 23, and went 0-2 while hosting the Magpies and Crows on October 7. Dinny Navaratnam from the www.afl.com.au website has reported that delisted St Kilda ruckman and American recruit Jason Holmes is seeking another chance at the highest level. Holmes has been regarded as a success story in the transition of international footballers to the highest level of AFL football. Whilst clubs cannot continually take chances on unproven talent, Holmes makes an interesting case for himself. DELISTED ruckman Jason Holmes is determined to extend his four-year career as the first born and raised American to play at AFL level. Holmes, who turns 28 on Saturday, has lined up in five matches since being picked up at No.36 by St Kilda in the 2013 rookie draft. None of those games came this year as Billy Longer established himself as the Saints' primary big man, with Tom Hickey and Lewis Pierce also competing for a spot in the senior side. The USAFL Divisoin 1 Men's and Women's trophies headed to San Francisco after the Golden Gate Roos defeated the Los Angeles Dragons comfortably and the San Francisco Iron Maidens defeated the Denver Lady Bulldogs by 8 points. The Quebec Saints took out the Division 2 title with a big win over Orange County. In Division 3 it was Seattle who defeated the home team in San Diego by 7 points. And in the Women's Division 2 the Portland Sockeyes defeated the BWE combination squad. Day 1 of the 2017 Nationals was played in warm breezy conditions at Sun Sports Park in San Diego. The six fields were in great condition for football and the setting was picturesque. In the Men's Division 1 Pool A the Los Angeles Dragons were the only team undefeated and if they beat the winless Baltimore Washington tomorrow morning they will head into the final to take the title. They defeated New York Magpies by just one point and then clearly defeated the highly fancied Austin Crows. Their most likely opponent is Golden Gate. Golden Gate showed the best skill, pace and strength in Pool B to also remain undefeated with solid wins over Calgary and Dallas. Denver stand in their way tomorrow morning but even a loss in this match could see them go through on percentage if the margin is low. Division 2 Pool A will be a battle between Orange County and Minnesota for a final spot while Houston look most likely to take out Pool B. All the results from today's matches can be seen below. The Friday before the US Nationals for most of the 1500 competitors is a travel day. Arriving to San Diego by whatever means necessary they descend on the tournament hotels and register. But a decent size group are already on the ground. A mixture of administrators, coaches and some early arrivals. The Administrators conference ran throughout the Friday with various presentations by clubs discussing how they do things at their footy club and sharing ideas and experiences that can help others. The session was chaired by outgoing President Mike Shepherd. The 2017 USAFL National Championships will be held in San Diego this weekend. This is the first time San Diego has hosted the tournament and the first time in many years the tournament has been held on the west coast. Matches will be played throughout the day on Saturday (21st) and Sunday(22nd), but the official proceedings include Friday where a club administrators forum will run through that day and also coaching, umpiring and women's footy clinics will be held ahead of the official registration and welcome on the Friday night. This year's tournament will be the biggest in its 21-year history: 53 teams spanning seven divisions, representing nearly forty clubs across the USA and Canada. While Myk Aussie's countrymen back in South Australia are sleeping, the Canadian based expat is out doing his bit to promote the Aussie football code across North America. Appearing on the Fantasy Sports cable TV Network with host Gabriel Morency this week, Myk previews the 2017 AFL Grand Final featuring his beloved Adelaide Crows playing the Richmond Tigers. You can watch him on the clip below. WASHINGTON, DC – Over 100 Washingtonians came out to see the Baltimore-Washington Eagles men’s and women’s teams at Anacostia Park on Saturday, as they played host to the Boston Demons and North Carolina Tigers. It was a sunny day of Australian football in the nation’s capital, with canopies and picnic blankets decorating the boundary line, and the BBQ grilling all day as spectators watched the Eagles men’s and women’s teams compete in the first USAFL games held in DC this year. 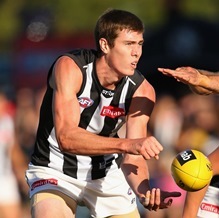 Mason Cox will remain a Magpie after signing a three-year contract extension with the club which brought him from the United States to Australia. The 211cm American first began honing his AFL skills at Collingwood as a Category B international rookie in 2014 playing in the VFL. Since, the Dallas native has played 20 AFL games – including nine as a key forward and ruckman in 2017. Speculation in recent weeks around his contract had seen him linked to Hawthorn, Richmond and Brisbane as possible destinations for the American.